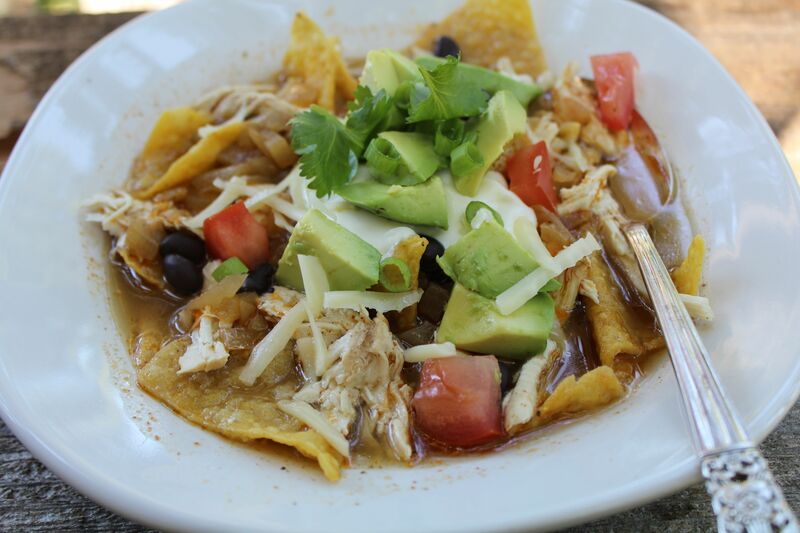 Fast and delicious tortilla soup with all the fixin’s. 1. Cook Onion: Heat oil in a large heavy pan or Dutch oven over medium high heat until shimmering but not smoking. Add onion, cumin, ancho chili powder, garlic powder, oregano and minced garlic. Cook until onion is soft, about 4 minutes. 2. Cook Chicken: Add broth to pot and bring to a boil. Add chicken to pot, reduce heat to medium, and cook chicken until it is no longer pink and is just cooked through, about 15 minutes. 3. Shred Chicken: When chicken is cooked through, remove from pot and set aside on a plate to cool. Return broth to a boil and cook for 10 minute, stirring a few times. When chicken is cool enough to touch, shred into pieces that will fit on a spoon. 4. Finish Broth: Remove pan from heat. Add black beans and lime juice and stir to combine. Cover and let rest 5 minutes, allowing beans to heat through. 5. Serve & Enjoy: Divide the tortilla chips evenly among serving bowls. Repeat with shredded chicken. Ladle broth into each bowl. Top each serving with with tomato, then avocado, then sour cream, then grated cheese, then cilantro and finally, the green onions. Serve immediately. Enjoy!